By Amy Sherman, Manuela Tobias on Tuesday, November 13th, 2018 at 1:40 p.m. Without any evidence, President Donald Trump and Gov. Rick Scott have floated accusations of fraud in two left-leaning counties in the aftermath of the Florida election. "Every Floridian should be concerned there may be rampant fraud happening in Palm Beach and Broward Counties," Scott said at a press conference Nov. 8. "And the Broward Supervisor of Elections Brenda Snipes has a history of acting in bad faith." Both Scott and Trump have cast suspicion about the rising number of votes in the days following election night, causing Scott’s total to dwindle in his bid for U.S. Senate. Trump called the rising number of "found" votes the "Broward Effect" and tweeted that he would send lawyers to "expose the fraud!" "The Florida Election should be called in favor of Rick Scott and Ron DeSantis in that large numbers of new ballots showed up out of nowhere, and many ballots are missing or forged. An honest vote count is no longer possible-ballots massively infected. Must go with Election Night!" he tweeted. Scott’s race is one of three statewide races in which a machine recount is underway. As of Nov. 10 when the recount was ordered, Scott was about 13,000 votes ahead of U.S. Sen. Bill Nelson. In the governor’s race, Republican Ron DeSantis led by about 34,000 votes, and in the state agriculture commissioner race, Democrat Nikki Fried led by about 5,000 votes. While there have clearly been problems in Broward, that’s not the same as actual fraud. It’s normal for counting the ballots to continue for days; under state law they had until noon Saturday following the election. Snipes’ counterpart in Palm Beach, Susan Bucher, said in response to Scott’s comments, "I think it's unfortunate that some of our highest elected leaders in the country are trying to impede our democracy because they don’t like the demographics of our voters. We are here to count ballots. We have to adhere to the laws. I would suspect that they really don't understand the process." As Scott decried "these shenanigans" in South Florida, two agencies that he oversees said they had nothing to investigate. On Nov. 8, Scott asked the Florida Department of Law Enforcement to investigate while he also announced he was suing Broward and Palm Beach election supervisors. But FDLE spokeswoman Gretl Plessinger said that no allegation of voter fraud has been sent to the Florida Department of State, which oversees elections. "We do not have an active investigation," Plessinger said. Republican Attorney General Pam Bondi then blasted FDLE for not investigating, and the next day the two offices released a joint statement saying they are "actively engaged in monitoring processes for potential criminal activity." Sarah Revell, a state elections spokeswoman, told PolitiFact, "Our staff has seen no evidence of criminal activity at this time." On Nov. 12, a Broward judge denied Scott’s request to impound voting machines when they are not being used in the recount, though he did call for adding more sheriff’s deputies. Scott's lawyers stated in court documents that Snipes was engaging in "suspect and unlawful vote counting practices" and called for "halting ongoing election fraud." Broward Judge Jack Tuter called on the lawyers to produce proof of fraud rather than just allege it. While there hasn’t been evidence of fraud in counting the votes, there has been a long list of errors and problems following election night in Broward. For example, Scott’s campaign noted that days after the election Broward mixed in about 20 rejected provisional ballots with about 200 legitimate ones. The Nov. 11 recount was supposed to begin at 7 a.m., but blaming equipment glitches, the first step of separating pages started a few hours late in Broward. Coupled with Snipes’ history of errors, sluggish vote counting and lawsuits, the office has developed a reputation as a sloppy operation. Earlier this year, a judge found Snipes prematurely destroyed ballots months after a congressional election, leading the state to assign election monitors to Broward. In a separate case before the election, a judge ordered Snipes not to open mail-in ballots until the canvassing board convened. After the midterm election, Scott won lawsuits filed against Broward related to public records and against Palm Beach about procedures for duplicate ballots. Again, neither case was about fraud. 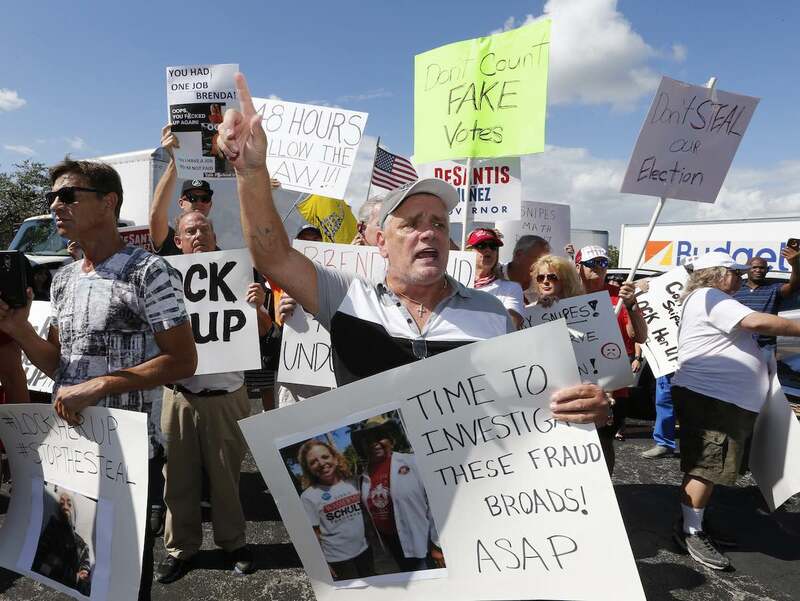 "It is possible here for two things to be true at the same time: There’s no evidence of fraud in the counting of votes in Florida, and the incompetence of Broward County Supervisor of Elections Brenda Snipes is deeply troubling," Rick Hasen, professor of Law and Political Science at the University of California, Irvine, wrote in Slate, noting that no state official or judge has found evidence of voter fraud. Charles Stewart, an MIT political science professor, said fraud generally requires an action with the intention of illegally manipulating the result of an election. While there may have been questionable judgements and mistakes, Stewart said, "none of this seems to involve a large number of votes, and none of it appears aimed at shifting the results of the election."